Why Don’t I Like New "Masterpiece" Discoveries? 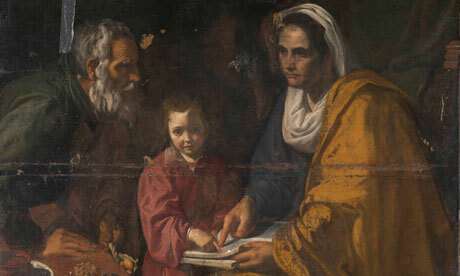 My friend heidenkind recently brought my attention to this article, which asserts that The Education of the Virgin (17th century, shown right), a painting discovered in the basement of Yale Art Gallery, is not by Velasquez (as was thought earlier this year). I have to admit, I was pretty pleased that the painting was unattributed to Velasquez. Is that strange? I would assume that most people are thrilled when they learn that a possible new work by Velasquez, da Vinci, Michelangelo, etc., has been discovered. And I rarely (if ever) feel thrilled about such news – particularly if the work has immediately been attributed to a great master. Instead, I get pleased when the painting is demoted from any “great master” status. Lately I’ve been trying to figure out why I feel this way. Some of you may remember me earlier post along these lines, in which I discussed my skepticism on the plethora of new discoveries. I haven’t quite pinpointed all of the reasons for my skepticism/hesitation regarding new discoveries, but I thought that writing this post might help me to organize my thoughts. I think that I mostly resist hasty attributions to great masters because I know a little bit about the politics behind art attribution – it’s tempting for a connoisseur to attribute a painting to a great master, since such an attribution would help further the publicity and career of that connoisseur. I’m particularly reminded of Abraham Bredius, the connoisseur who “discovered” the “Vermeer” paintings by the forger Han Van Meegeren. Bredius is lucky that he passed away soon after Van Meegeren’s confession in 1945. But is this political/financial reason why I don’t get excited about discoveries? I also wonder if my might have something to do with the historian side of me. If there are unknown works by great masters, then this forces me (as a historian) to reshape the artist in my mind as a historical figure. And I think I resist such reshaping a little bit. Does that make sense? In some ways, I feel like I know great artists quite well, and having a new work of art means that there is some aspect to their lives and work that was hidden from me. (I guess it’s kind of like the artist was doing something “behind my back.”) I know, it’s a little silly. Yet, at the same time, I love learning new things about artists. So maybe I experience some kind of inward struggle (i.e. the desire to learn vs. feeling deceived) when a new work of art is discovered, and that’s why I shy away from such discoveries. I don’t know. Ironically, though, I rarely feel skeptical when archaeologists announce that a new work of prehistoric/ancient art was discovered or excavated. I always think, “Hey, awesome!” and move on with my life. So my skepticism (and emotional attachment?) must be somehow related to the idea that these works of art are attached to early modern “masters” (i.e. individuals). There isn’t enough information about specific prehistoric/ancient artists (or even some cultures!) for me to get as defensive and protective as a historian. Instead, I almost always get excited about ancient discoveries. So, that’s what I came up with this evening: political/financial reasons and my silly protectiveness as a historian prevent me from embracing new “masterpieces.” What about you? Am I the only person who is continuously skeptical? Do most people get excited about attributions and “masterpiece” discoveries? Do any other historians get protective about an artist’s biography/oeuvre? 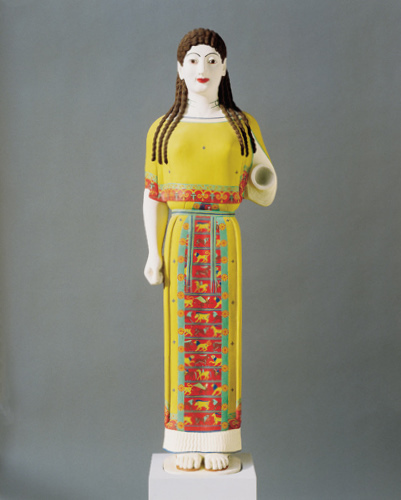 This current “un-peplos” argument is based on recent reconstructions and studies of the figurine. Instead of a peplos, it is thought that the statue is wearing a long robe, cape, and an ependytes (an outer garment which is a metal-like sheath divided into regular, rectangular compartments).1 The ependytes was an Eastern garment associated with divine power, and therefore suggests that this figurine would have represented some type of goddess, perhaps Artemis or Athena. I really like the animals shown on this ependytes, but I can’t tell what if a mythological narrative is depicted in the reconstruction. I kind of doubt it. But if anyone wants to have a guess at what might be depicted, you can click here to see better details of this reconstruction. Although this last image is of an older reconstruction, I thought I would still include it. 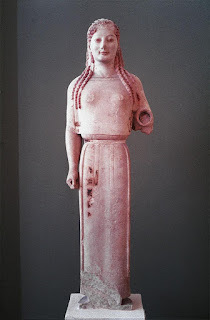 As mentioned here, this Cambridge reconstruction supports the idea that the statue represents someone who is offering a gift (which looks like an apple or pomegranate) to the gods (instead of actually representing a goddess, as argued by Brinkmann). She is shown as wearing a meniskos, an umbrella designed to protect the statue against the weather and bird droppings. I don’t know if we’ll ever have a concrete idea of what this statue looked like in terms of color and the ependytes design. There just aren’t enough paint samples for us to have a completely accurate reconstruction. 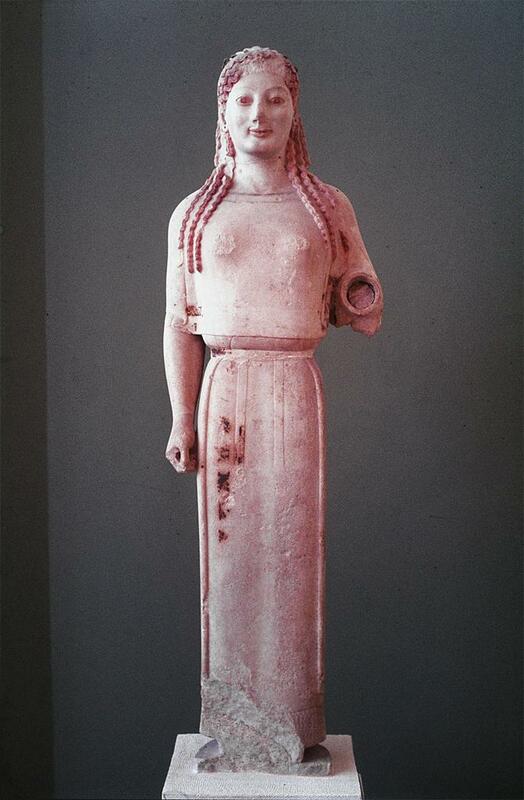 Plus, it will be hard to know specific details unless we ever come across the kore’s missing arm/hand. But it’s fun to think of the how this sculpture might have appeared (and who actually was represented!). 1 Richard T. Neer, The Emergence of the Classical Style in Greek Sculpture (Chicago: University of Chicago Press, 2010), 119. Source available online here. 2 Ibid. You also can read an English review of Brinkmann’s publication here (review by by Brunilde Sismondo Ridgway). Be sure to check out the penultimate paragraph and footnote #12 to find out more information about the Peplos Kore argument. 3 See Brunilde Sismondo Ridgway review (Bryn Mawr Classical Review 2004.08.07), footnote #12. Or, on the other hand, would you consider such art to be “second rate” and unimportant? Would you find forgeries to be uninteresting from a historical perspective, since the works of art are not deemed authentic and perhaps not as old as once supposed? Wouldn’t it be nice to relieve the SAM of such a problematic and questionable statue? I think it would be fun to take these works of art out of storage and put them on display. Although I know that some temporary museum exhibitions have been dedicated to forgeries (earlier this year the National Gallery in London held the exhibition “Close Examination: Fakes, Mistakes and Discoveries” (see a related Telegraph article here)), I don’t know of a museum that boasts a permanent collection of forgeries. Of course, if there was one museum dedicated to forgeries, what would that imply for the rest of the museum world? Would a museum of forgeries make other art museums seem more approachable? In other words, would a forgery museum undermine the cultural snobbery (and authoritative voice) associated with the art world? Or do you think that a museum of forgeries would perpetuate the incorrect voice of authority with the remaining “legit” museums, especially if the latter was no longer associated with forgeries (and by extension, mistakes)? Does anyone think that existing museums should embrace (and exhibit) the forgeries that are currently in storage – perhaps a museum for forgeries is unnecessary? What forgeries would you be interested in seeing in a museum? 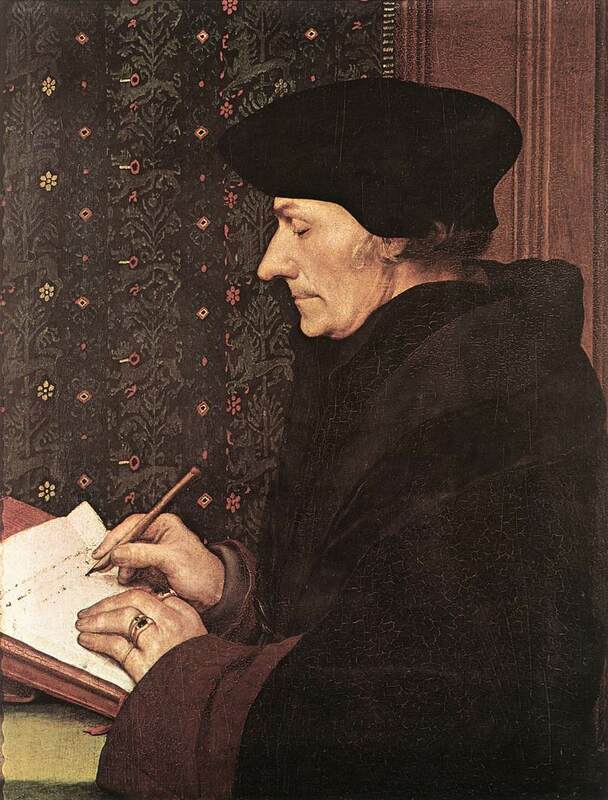 I know that I’d like to see works by Han Van Meegeren, the infamous Vermeer forger. 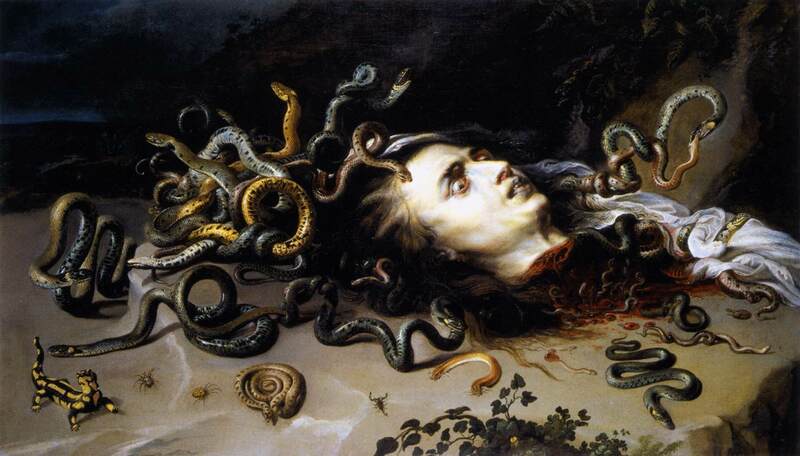 1 Kenneth D. S. Lapatin, “Snake Goddess, Fake Goddess,” in Archaeology 54, no. 1 (January/February 2001): 36. Abstract of the article is available here.